Home » Knowledge base » Learning » inCust mobile app: information about the company, points of sale, contacts, loyalty programs. 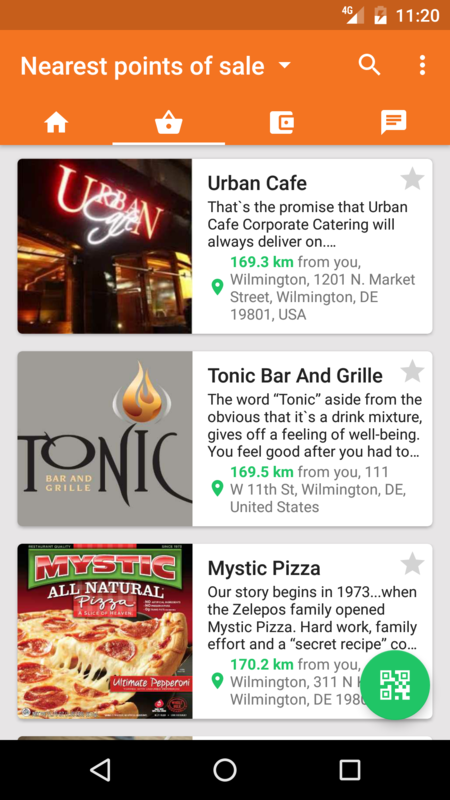 inCust mobile app for customers is a mobile decision for business cooperation with customers. This is a powerful channel of advertising of your company, as well as the platform of communication. The market trend is that before buyers didn’t want to take in the stores new cards and now they don’t appreciate installing the applications. The inCust solution combines the best practices: business gets its own loyalty program and advertising platform, while the buyer gets only one application. and find in the search box ‘inCust’. After installation of mobile app it is necessary to register: set country and mobile phone number to which will be sent SMS with confirmation. For authorization you have to enter PIN from SMS sent to entered phone number. Now you are at main page of application. Click Show card. Buyer can use secured digital card in form of QR-code at the cash desk. It has high level of security and it couldn’t be copied or used on another device. Lower there is news and special offers of points of sale that are within walking distance to the customer. This function – geo-targeting – will attract new customers to your points of sale. Next tab is mobile catalogue of points of sale. By default it is sorted by location (nearest), but customer can use another filters: by categories, by recently visited, starred (checked with star). It is possible to search points of sale for their name. Next tab is wallet of the customer. At any moment customer can look at his bonus points, accounts and achievements. inCust is not a coalition loyalty program. Bonus points and gifts only refer to your business, so customer will return exactly to you to use them. To view information about your business customer needs to go to the company portal. 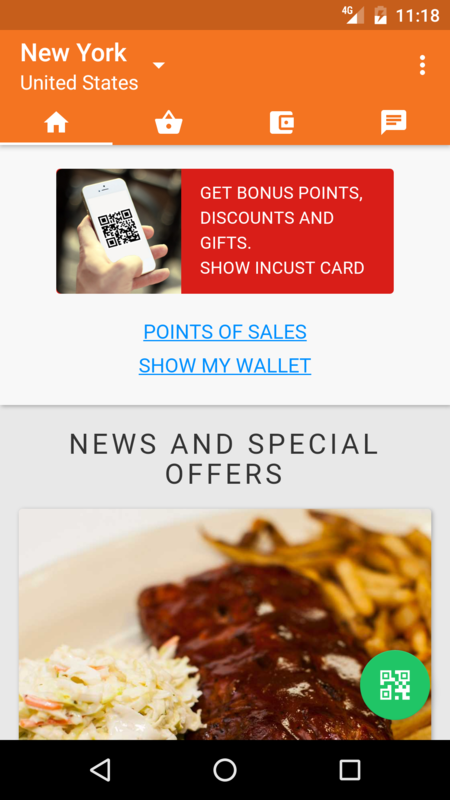 Portal is your business page in the inCust mobile app for customers. The history of your purchases. Let’s fill in all the necessary data in the Control panel. To add a description of the loyalty program in the customer application go to Loyalty programs in the Control panel of your business. 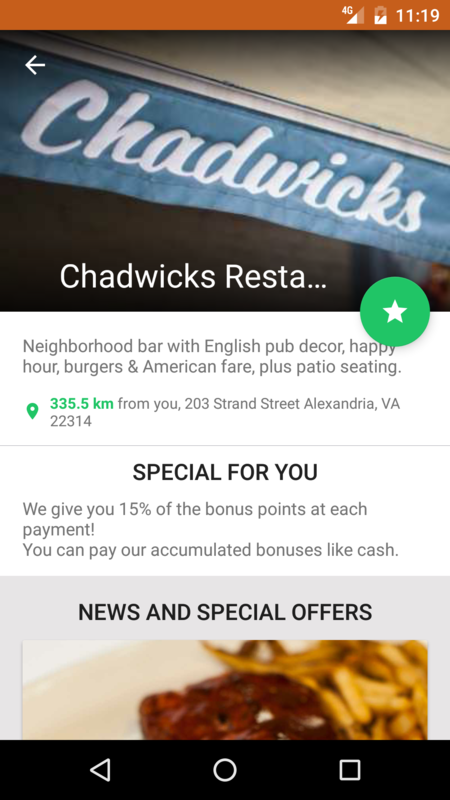 Click in the table Change loyalty program. In the inCust loyalty program is a set of rules of service provided to your customers, as well as the business name or brand, which is visible to customers. Therefore, in setting the rules of the loyalty program, we ask things that usually refer to the network of your points of sale or your brand. Let’s start entering information from the name. Loyalty title won’t be shown anywhere it is internal name only for you. Lower there is Public title; this is public name of your business or network. You will name points of sale later, now you are giving general name. For example, Super Pizza. See how they are displayed in the mobile application at the bottom. Customers can see information about you in that language, which is essential for their devices. Therefore we recommend to set several languages. Then we will set logo. The most important thing that your customers will be looking for is a description of your loyalty program. You are building a long-term relationship with customers, so try to describe transparently and concisely. For example: 10% in bonus points on every purchase to your bonus account. Let’s get higher and set categories of which your business is related to. Take a note that you can choose more than one category. Look where it is used in a mobile application, click on the Mobile catalogue. At the top of the application there are categories of business. You can specify the link to the website and the social networks of your business, so customers can go from a mobile application directly to website or social media page. Links are displayed below the information about feedback. Please note: we do not set the phones on this tab. We will set them later, while entering data on points of sale. Add picture. It is desirable to add the logo of your business or trade network. It is located under Feedback. We continue to set the points of sale in which loyalty program is working. To add description of the point go to Points of Sale in Control panel of your business. If you have few points of sale, you have to repeat this process the appropriate number of times. In the table opposite to the point of sale, that you want to specify in a mobile catalogue, click Edit in the Actions column. The section has a special tab Point of sale publishing. Public title of your business – this name will be displayed in a mobile application, customers will be looking for it to find your business. Public description – what you sell goods and/or services; description often is for information purposes and is published at the top below the image. Description is displayed in the portal of your sales point directly under the image. As the rules of the loyalty program, the description of the point is recommended to be in multiple languages for maximum coverage of potential customers. Address – enter the address of point of sale (if you have multiple sales points, you specify each separately). Addresses of all points are shown at the bottom of the portal. They should be necessarily indicated for the reason that the customer mapping of points and businesses are linked to its location. The higher store is in the mobile catalogue, the closer it is to the customer. Point of sale picture – add quality and the actual image, it will help your customers find you. It is published at the top of the portal and a mobile catalogue of all points. Phones – add phone of point or the administrator’s phone. The phone numbers are displayed under the description of point of sale. Fill in data as possible correctly and your customers will find you easily. When you have filled in all the fields, click Publish. Soon your publication will be reviewed by the administrator. Go to the application and make sure that all information has been entered correctly. You can update the information about the points of sale without verification simply making changes. Go to the Points of Sale in the Control panel and in the column Mobile app publication look at status of information publication.